Sara Hall discusses her CIM win and her excitement toward running the Boston Marathon for the first time in 2018. A mere five weeks after running a 2:27:21 personal best at the BMW Frankfurt Marathon, Sara Hall crossed the finish line of yet another marathon. 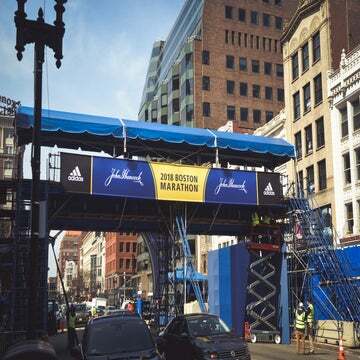 Among elite runners, such an aggressive racing schedule is virtually unheard of. Hall’s husband and coach, Ryan Hall, who is a retired long-distance runner, Olympic athlete and American record holder in the half marathon and marathon, was initially skeptical of her plan. Ultimately, Hall, 34, decided to listen to her body and compete in the California International Marathon (CIM) on December 3. “The first week after [Frankfurt] my legs came around relatively quickly, and the next week I actually did some of the best workouts I’ve ever done, so that gave me the confidence that, by race day, my legs would be under me,” Hall explained. Even though she felt confident about her choice to complete the CIM, it was a difficult decision to make. “It was still a bit of a leap of faith, because in the marathon you really need to be firing on all cylinders,” Hall said. She credits less-than-ideal conditions in Frankfurt with enabling her to recover quickly enough to compete at CIM. This tactic of listening to her body and embracing recovery allowed Hall to approach the CIM start line completely relaxed. “This [marathon] felt different to me because my last two were international…but for this one, I was home doing homework with the kids just a few days before the race and it didn’t really feel like I had a race approaching,” Hall said. To help herself mentally prepare, Hall drove the course two days before the race. But instead of helping her get race-ready, the course preview had the opposite effect. Initially, Hall thought she would be able to obtain a PR at the CIM, but after realizing the course was more challenging than the elevation chart showed, she reassessed her goal. “I had a little attitude check and realized I needed to come up with some other things I felt excited about other than PRing, in case I was off pace out there, so that I could stay engaged,” Hall recalled. Throughout the 26.2 mile race, Hall altered her race strategy several times. She began with the hope of breaking the course record, then adjusted her goals to strive for a personal best and finally set her mind to winning the race. Even while changing her approach, she made sure to keep one thing consistent: listening to her body. Staying in tune with her body enabled Hall to win the race with a time of 2:28:10, which is the second fastest winning time ever clocked at the CIM. 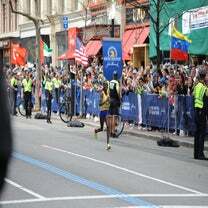 Hall was more than two minutes faster than the closest female competitor. Hall also acknowledged the incredible crowd support, which kept her remain energized throughout the race. After a wildly successful year, Hall has big hopes for 2018. Her next race will be the Boston Marathon in April 2018. But first, Hall will take a much-needed breather.